Imagine that you have a dream that is so real you cannot chase the images from your mind. In this dream you are riding a horse through the Great Plains of South Dakota. It is one of those dreams that seem to go on forever, and just before you wake up, you find yourself and your horse at a riverbank watching 38 men being hanged. In the instant before the platform snaps open beneath them, the condemned men reach out to each other and lock hands and arms. You discover that no matter what you do, you cannot forget the dream, and as you try to find out more about the imagery, you learn that the events in your dream really happened. Your dream was not a lonely nightmare, but a window into history -- the day after Christmas, Dec. 26, 1862, when President Abraham Lincoln ordered the largest execution in United States history -- the hanging of 38 Dakota (Sioux) men. Dakota 38, produced by Smooth Feather Productions, is an impeccably produced high-definition feature-length film that tells the story of Jim Miller, a Vietnam veteran and spiritual leader, who finally came to believe that his dream was a message from the Creator. Unable to ignore the calling, Miller resolutely determined that he must live his dream and ride his horse east from Lower Brule, S.D. to Mankato, Minn., where the execution took place. Miller was compelled to honor his ancestors and at the same time heal himself. As if in validation of the message, descendants of the Dakota 38 learned of Miller's plan to retrace the 330-mile route revealed in his dream and joined him on a journey through blizzards and incredible physical hardships. "When you have dreams, you know when they come from the Creator. As any recovered alcoholic, I made believe that I didn't get it. I tried to put it out of my mind, yet it's one of those dreams that bothers you night and day. We can't blame the wasi'chus [greedy person] anymore. We're doing it to ourselves. We're selling drugs. We're killing our own people. That's what this ride is about, is healing." In a beautiful example of synchronicity, the dream inspired the man and the man inspired the art of the film. Smooth Feather Productions masterfully presents the 2008 recreation of a man's vision that has now become an annual event. 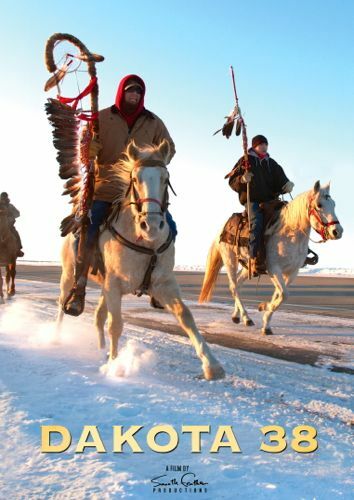 Dakota 38 is a film rich with imagery and important spiritual teachings. Central to this imagery is the horse. Dakota belief says that the horse represents the sacred six directions, without which healing is impossible. The front legs are west and north; the back legs, east and south. The head and ears point to the heavens, and the tail anchors all to the earth. In the film, there is a rider-less paint horse. A year after the execution of the 38, Sitting Bull rode on horseback to see the concentration camps in South Dakota. He said that his people were housed worse than animals. Miller believes that Sitting Bull and Crazy Horse were present on the journey to the hanging site, and offered the paint as their mount. Composers Jay McKay and Jay Parrotta spent three years fusing sound and visuals into a cinematic experience that takes the viewer onto the Northern Plains and through a relentless pounding blizzard. Sound has the ability to transport, and the mix of chants, drums and melody is spellbinding. The whinny of the horses, the sounds of their breathing, the wind whispering through the prairie grasses, and the click of cinches tightening brings the viewer deep into the experience and Jim Miller's dream. One can almost smell the sweet sweat of the horses, see the fear and determination in their equine eyes and experience the pain and discomfort of the riders as they push forward with nothing but grit and the kindness of strangers along the way to sustain them. But, kindness can be everything. And walking in the practice of kindness is a solid path to healing for a People who have experienced the worst the world has to offer. Peter Lengkeek tells the story of his grandmother wondering about the deep genetic depression that is passed through the generations. "There is something that we suffer from," Lengkeek says as a preface to the heartbreaking and gut-wrenching testimony of rider Craig Bullbear fifteen minutes into the movie. Watch it, if you don't have the time to do anything else. "The Indian hunting trade, if the game be at all plenty, is likely to prove a profitable investment, during the present fall and winter to our hunters and scouts in the Big Woods, the Commander in Chief, by General Order No.60 having increased the bounty for each top-knot [scalp] of a "bloody heathen" to $200. There is likely to be considerable competition in the trade, and the best shots will carry off the most prizes." The historical back-story is devastating. The Dakota War of 1862, also known as the Sioux Uprising, began along the Minnesota River in southwest Minnesota. It was predicated on treaty violations, forced containment on land too small to support the people, and withholding of promised food and other supplies. In a legendary statement, a trader named Andrew Myrick announced that if the Dakota were hungry they could "eat grass." On Aug. 17, 1862, one young Dakota with a hunting party of three others killed five settlers. Battles escalated between settlers and Dakota and finally the U.S. Army. It ended with the surrender of most of the warrior bands and the capture of more than a thousand Dakota, who were interned in jails in Minnesota. The execution of the Dakota 38 by order of President Lincoln was the final blow. "Ordered that of the Indians and Half-breeds sentenced to be hanged by the military commission, composed of Colonel Crooks, Lt. Colonel Marshall, Captain Grant, Captain Bailey, and Lieutenant Olin, and lately sitting in Minnesota, you cause to be executed on Friday the nineteenth day of December, instant, the following names, to wit [39 names listed by case number of record... The other condemned prisoners you will hold subject to further orders, taking care that they neither escape, nor are subjected to any unlawful violence." As the season of lights, mystery, and sacred observances for Christians approaches, this movie surpasses all of the current holiday fare in a time where wars, conflict, and atrocity dominate the headlines. In an email conversation, producer Silas Hagerty said the film is being offered for free as a "tool for healing and reconciliation." This year riders from the Fort Peck Reservation in Montana as well as from the Standing Rock Sioux Tribe in North Dakota have committed once again to the ride. For the first time riders from the Santee Dakota Tribe in Nebraska and group of Dakotas from Manitoba Canada will also be riding. Elders from several reservations will be transported to be present at the hanging site ceremony in Mankato on Dec. 26, 2012. The National Museum of The American Indian in Washington, D.C. is screening Dakota 38 daily for the month of December. Screenings are free to the public and start at 3:30 p.d.. daily. Note: I watched Dakota 38 streaming on Apple TV, iPhone4s, iPad and iMac desktop. The HD resolution is stunning on all devices.